I went to CSHA two weeks ago and met the people who work at Virtual Speech Center! They allowed me to review an app of my choice. I was choose Multiple Meanings Library available for 12.99 in the app store. I am always looking for more resources for multiple meaning words. Many of my students need to work on their skills in this area. When you press the "start" button you are able to input multiple students names. Then are able to choose one student or multiples for taking turns. When you select a student you are lead to this screen. PRO: nice long list of 122 multiple meaning words! Also gives the options to target specific word. For example: if a student has mastered words, you can take them out, or you can target a specific set until mastery and move on. CON: You must complete this for each student you input, which can be time consuming to start. CON: Again, you have to pick the specifics for every student. Which can be great! However you have to plan to set it up first! Most practice pages look like this, you can specify in setting to automatically turn page. However it was nice to turn that feature off so you have time to teach/review alongside the app! PRO: Realistic pictures, professional voice recording! I like the option to record the students responses! Makes data tracking easier. Also has a button for SLP to record correct/incorrect on the making up sentences. This app also has a record at the end, which reports % accuracy and can be e-mailed! CON: If students are in a group and taking turns, it often repeats the same word for the next student. Thus, validity is compromised! Students also became tired of hearing the same words. 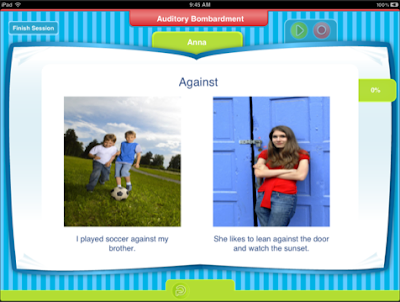 PRO: With this many different options for practice, it can be used to just listen to all the words (auditory bombardment), decide the meaning, make sentences up! CON: My students grew tired of this very quickly. 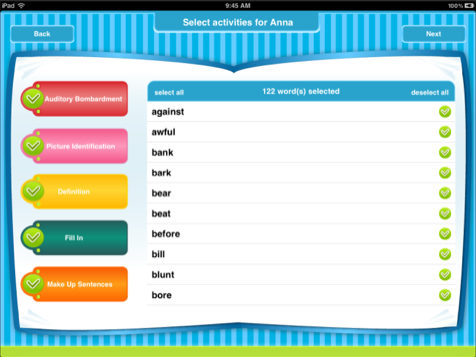 The app reads the words, definitions, sentences. That is it, no games, no animation. It is rather simple (which for some can be a pro) but after a few words the monotony became too much for my 4th graders. I think using this alongside token economy or game board would make this more fun! Overall Royal Treatment: Favorite part is the long list of words! Very extensive and if you are tired of using card packs this is another option. Great for data tracking, voice recording, and varied levels of mastery. 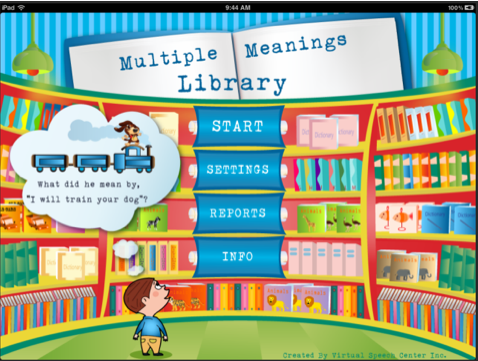 Beware-it is not the most entertaining app out there, but it does what it says...a library of multiple meaning words! I was given the app for free, but receive no other compensation. These opinions in this review are my own.